I’ve found a way to get everyone moved from point a through point d in the software for ClubKnit so I’ve opened up membership to new Basic (free) members. Now, you all are members already, but expect to start receiving more emails from me based on what you are members too. And remember that you can now easily participate in the forums (discussion) by clicking on the comments for any blog. Join in!!!! 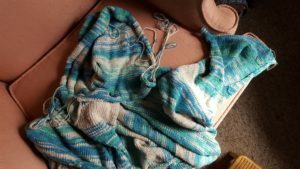 Do you want to read the Clear the Clutter post I just wrote over at Knittingtoday.com? 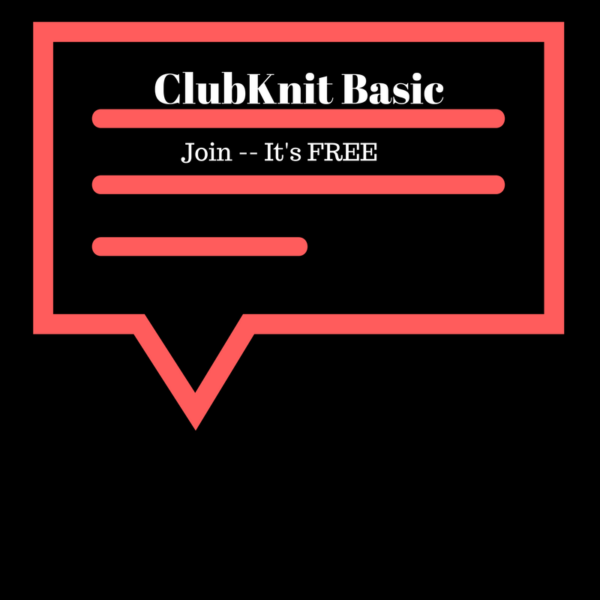 Or, do you want to refer a friend and have them join clubKnit Basic? How about participate in the next cardigan KAL for hand knitters — FIsher Lassie? Or join in the ongoing KAL for LK150 knitters — Stormy Weather? How about getting more info about the upcoming meetup in Wolcottville at our previous store location? Stay tuned for details — Knit28!!! Is a cardigan/tunic/sweater not to your liking this time around? Stay tuned, we have some smaller-type projects in the works for the upcoming months. I know, I know. You guys are patiently waiting for everything to come together. Well, I can say progress is definitely being made. 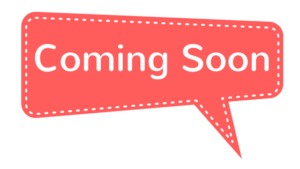 The classroom is being set up, the forums a/k/a the ClubHouse discussion group is functional, the email plans (Connections) are coming together, and the Blog (Lessons) is being renovated. Woohoo!!! The most recent change has been about the new Forums software. It is called Discourse and it is the bomb!! How do you use it? Just comment on this post. You should automagically log in. And have access to any content your purchaser level provides. For example, the free members have access to the free hand and machine forums. And, if you are a project purchaser (ala carte), you can also see the project discussions. Of course, the beta-subscriber purchasers get special treatment, with access to anything and everything. (Beta-subscriber members info — limited time only $50/annually). I know I keep announcing it, but my sample yarn is finally here. And, I’ve made my lesson plan list. 23 lessons just on page one!!!! 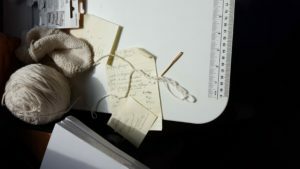 Next up is to figure out how to get the project packs put on knittingtoday.com so we can take orders! In the meantime, I’m going to start swatching the yarn. See how beautiful it is?? I love the way Stonehedge makes their yarn, pin drafting the fibers so the colors have a lot of depth. My cast on edge on Cassidy has given out, and I’ve lost some buttons, so I’m really looking forward to getting this project done. I can see it easily becoming my favorite wear around jacket. Just before Christmas, Tara was here to knit a project for Haley on the LK150. It was a Bias Knit scarf using a long-repeat self-striping sock yarn. It was a really fun project and we live streamed it to a few closed areas on facebook just to get a feel for how the lighting, camera setup and everything was going to work. [we ended up purchasing more equipment]. I’ve decided to put it together as a sample class so everyone can see how the flow of the website will work. Its a very basic technique, yet has about 6 lessons. 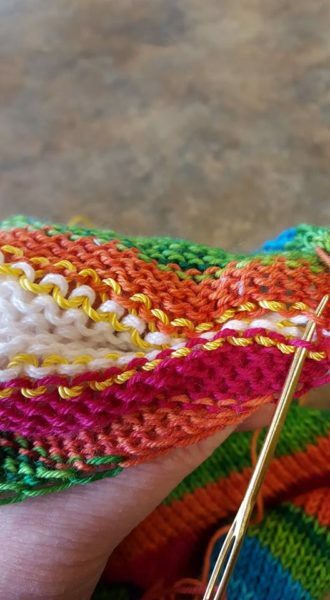 The featured image for this project shows a quick way to Kitchener Stitch. In fact, I sat at the coffee shop and finished it off on Christmas Eve for her. A lovely, relaxing way to head into a busy holiday weekend. Basic — Free registration and access to community Forums, blog posts. 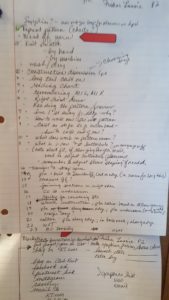 Ala Carte — All of Basic, PLUS specific discussion areas, blog posts and online classes depending on the project. Subscriber — Annual membership fee that opens up ALL of the ClubKnit site (currently 1/2 price! 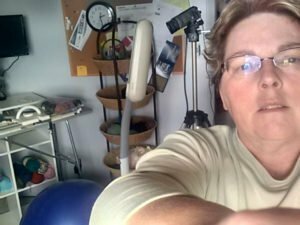 ), specifically technique tutorials, one-on-one help, discounts on supplies for projects, reduced shipping, online technique library. To be notified when the Basic registration is open, fill out this Form! 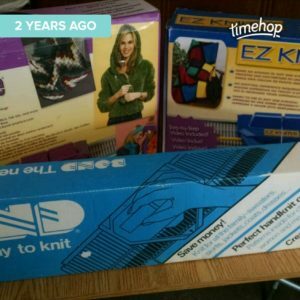 Two years ago, I thought my business was taking the direction of supporting Bond knitting machine owners with an online presence, courses and troubleshooting. instead, Spinrite announced they were ceasing production. After 23 years of working with the Bond machines, it was time to change direction . That direction change has allowed me to focus on the hand knitters and Lk150 owners. Projects, KALs, classes . . . all with the emphasis on Community. I’m so excited!! Welcome to the new community forum site. The features are numerous. Go ahead, go to http://forum.knittingtoday.com and check it out! Go ahead . 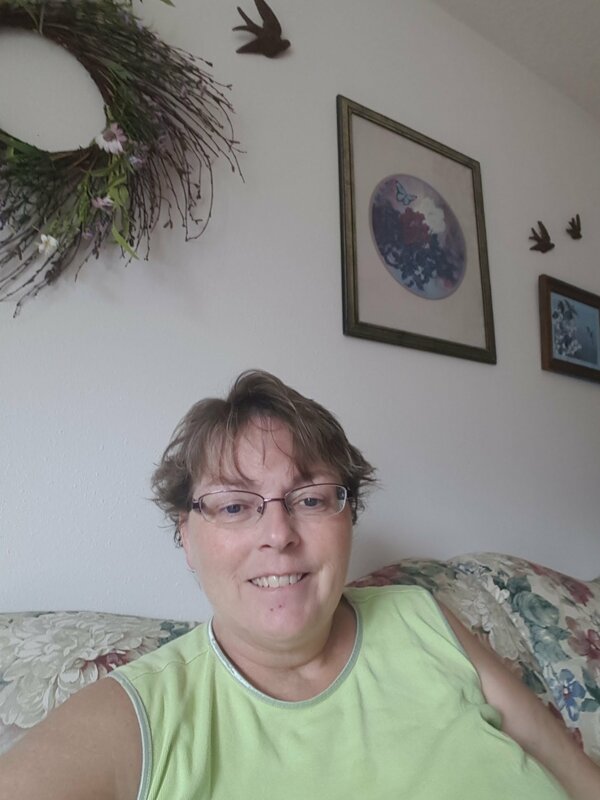 . . http://forum.knittingtoday.com … comment and let me know what you think! Hi, just checking to see if this post will populate in the BLog Post category in the Forums and if the reader needs to be logged in to see it (WLM protection is off). And if discussion takes places on Discourse, do you need to be logged in and who can see the discussion if it populates back to the unprotected blog?? The other thing I need to do is figure out how to link to the forums from the Basic (free level) . . . . So, today I’m working on getting the “after login” page useable. I want everyone to be able to see the courses they are enrolled in and be able to access the latest blog posts and forum posts. Was it a success? Well, no. I’m waiting for support to answer an email and tell me what shortcode to use for the page. Its not going well 🙁 . . . .
so I decided I’d work on blocking Stormy Weather. I just need to get it wet and lay it out to dry sort of stretching the lower part of the sleeve to accommodate my fat forearms. 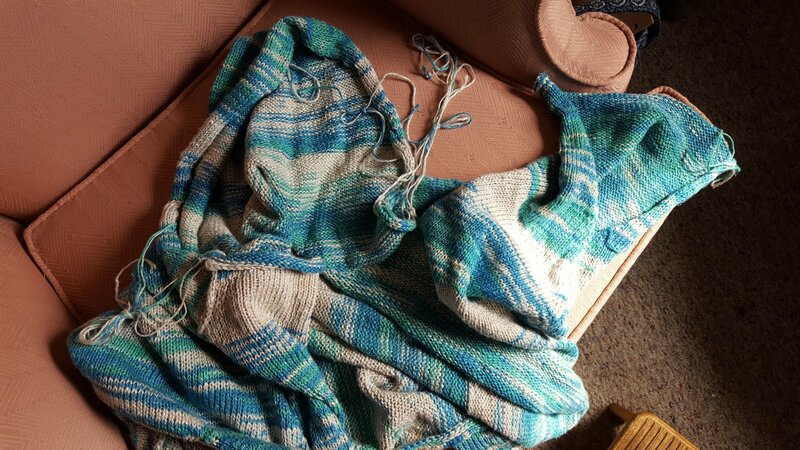 When I pulled it out of the bin, I noticed strings hanging from the hood and sleeve. Duh! I forgot I’d taken one of the sleeves apart to fix the cuff bind-off. Sigh! I go on the hunt for my Chibis. What a mess my office is after bringing home things from the store. Nothing has a permanent home yet and I can’t lay my hands on what I want. I’m so frustrated. I spent an hour looking around in baskets, bags, and even a suitcase. Hah! Look what is in plain site on my desk! Ugh! I’m closing up the office. Done for the day. Going to get outside for a short drive and refresh my head. I wish I had $3000 to just hire someone to make this all work so we could get busy with the task of Knitting. If you’d like to help fund this, just purchase the beta-Subscriber package. Well, it’s that time of year to start the fall knitting. I am desperately trying to keep my project list at under 6 projects (two knitalongs, two classes, a club, and an original design). Yikes! If you are thinking about joining in my knitalongs, the handknit one is Fisher Lassie and the machine knit project is Stormy Weather. 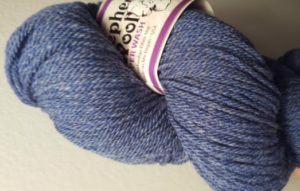 Save your $$ to get the yarn mid-September. I’ll be announcing signups via the newsletter soon. I’m still working on getting the e-commerce store functionality. Also working on the forums within clubKnit making it operational. Already done is streamlining the registration and purchasing process for beta-subscribers. Now to work on the free membership levels. I’m making progress, but would value more input and accountability. If you are interested in joining our Secret Cheerleading group on facebook, just send me a private message on facebook. Note, you can text my business line (260-351-2260) now as I’ve gone mobile with the telephone. Now, if you call me I may be at my mothers in Florida, my mother-in-laws in Michigan [currently!! ], my children’s in Indiana, or wherever else I decide to land now that my business is primarily virtual. Even thought I’m running a virtual business, in person meet-ups are sooooo very important to me and I am very much an extrovert (ENFP on the Briggs-Meyers personality scale). Please plan on joining a meet-up around 2-4 on Fridays at Great Lakes Coffee in Kendallville. I can’t say I’ll always be there, but I will try to be. We’re in the process of cleaning out the storefront as we have a few people interested in either leasing or buying it. Here’s the link to pictures of what we have left. Note that all of the knitting supplies left have been brought to our home office and are currently being listed on ebay. We have two ebay stores: bondknitter and icefisherman1 (although Tom’s tends to be garage sale finds with some knitting thrown in). I think that’s this week’s news. Stay tuned . . . .
P.S. editing to add that I am trying to set up a blog posting schedule for the members here, free and paid. I’m thinking a couple times a week, perhaps a technical post containing a technique (hand or machine), a www inspirational-type store, and a project update. Can you give me ideas on what you would like to read posted here?